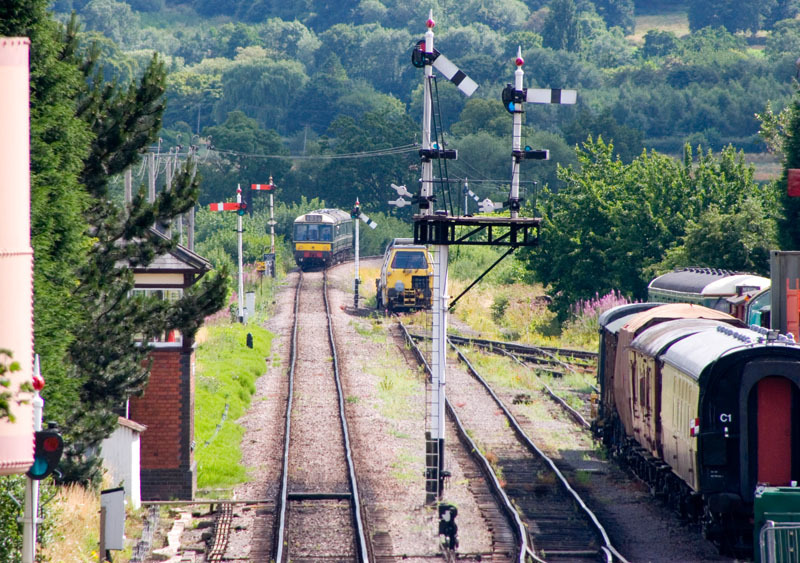 Toddington is the main station on the GW(S)R. This is the view from the station footbridge towards Winchcombe, with a train preparing for departure from the up platform. The up innerhomes bracket, with the station throat beyond. The up home, with the rear of the above signal visible beyond it. Between the up home and innerhome is this shunt disc. 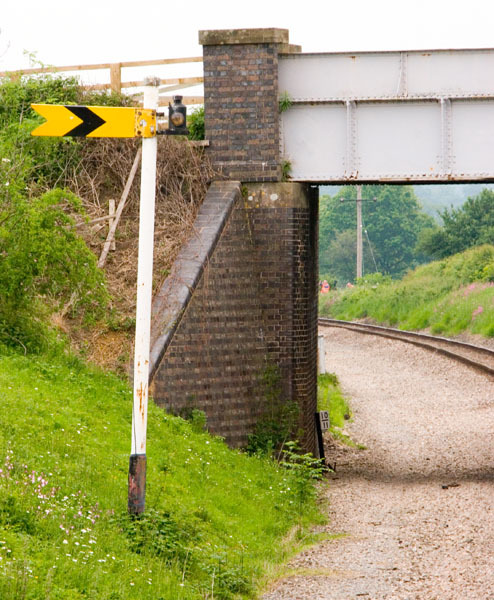 It can read either along the main line, as here (this is known as a "running shunt") or into the yard. 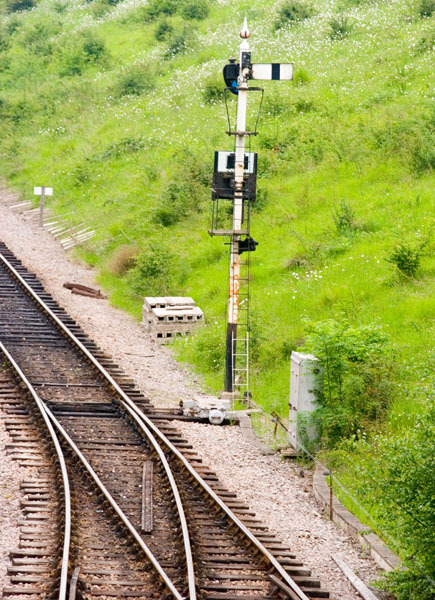 The points, and the latter move, are controlled from a ground frame released from the signalbox. 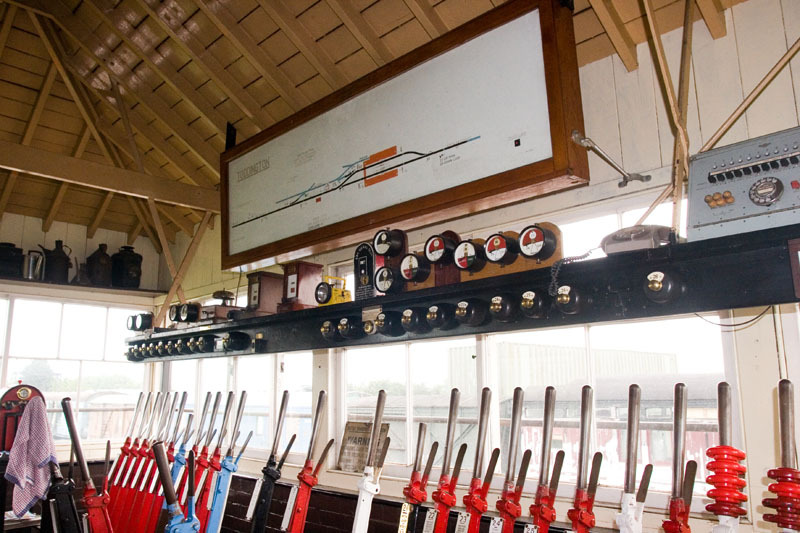 For normal running movements, it is controlled by lever 1 in the signalbox - there can't be many boxes where lever 1 controls a running shunt! 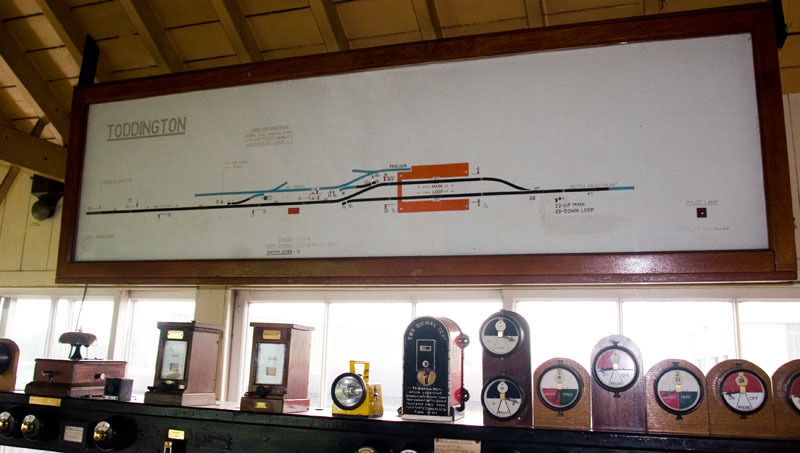 The signalbox here is the original GWR one, though its original lever frame had been removed so it now contains the one from Earlswood Lakes. 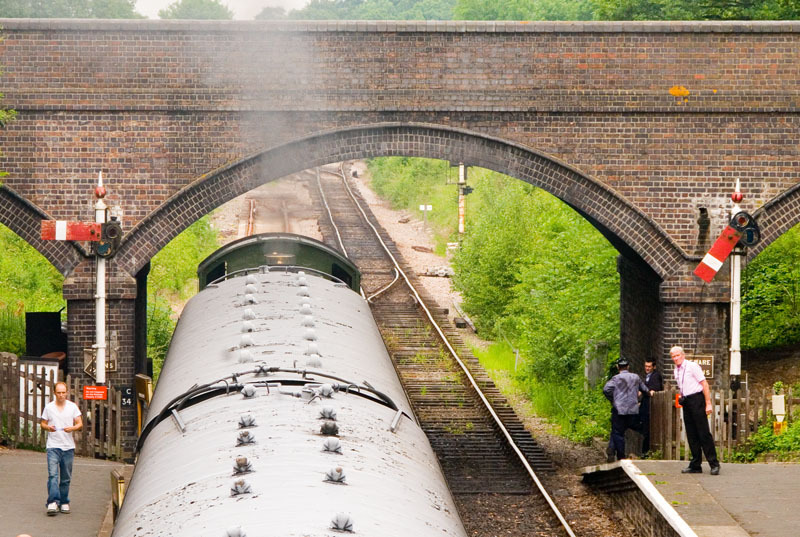 The signalman prepares to hand the single-line token to our driver. The down starter, with the advanced starter visible beyond. 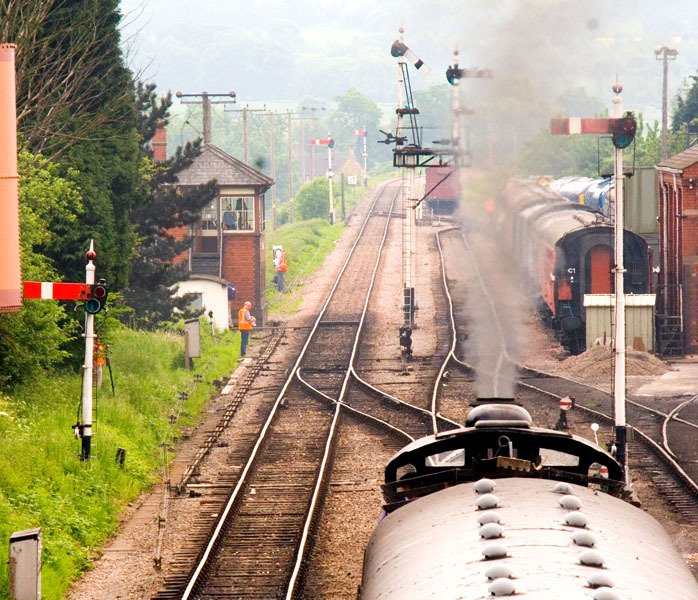 The far end of the station, and headshunt beyond. 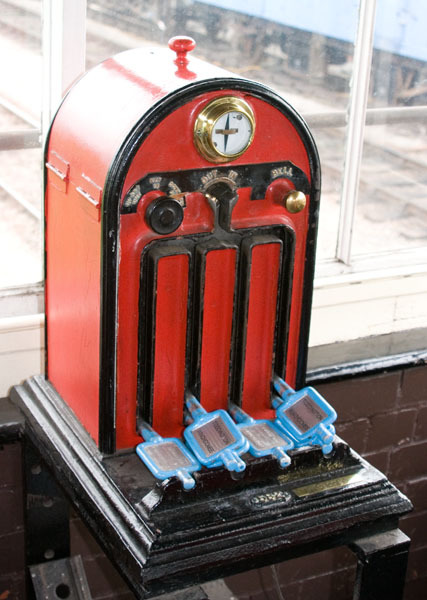 The headshunt starter, which has a "cash register" route indicator similar to the one at Worcester Shrub Hill. 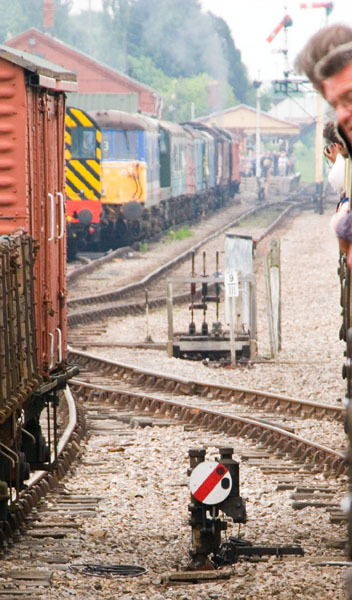 The calling-on signal cleared to allow a loco to shunt onto its train in the up platform. The box diagram, and some of the instruments and indicators on the block shelf. A close-up of part of the block shelf. 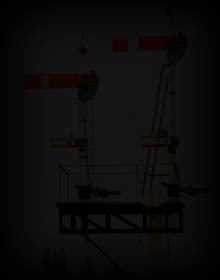 The leftmost indicator is a signal repeater; the adjacent one indicates whether the ground frame release lever can be operated. 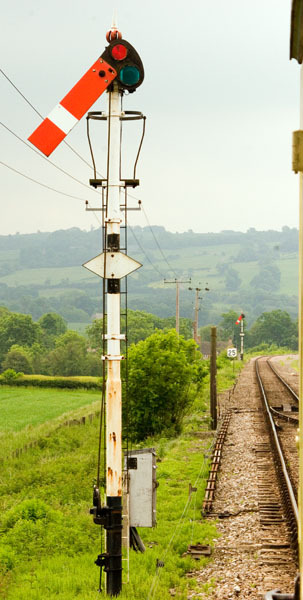 In the centre is the Winchcombe block bell, and on the right is a signal lamp (lit/out) indicator. 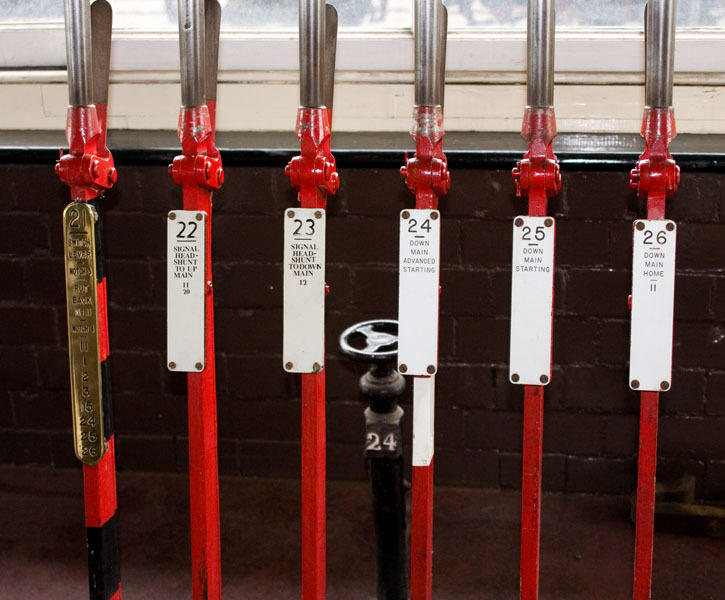 The plungers below the instruments are used to activate the electrical releases for levers that can be locked electrically by other equipment. A view of the interior from a different angle. A selection of signal lever leads (description plates). The small numbers below the lever function descriptions indicate other levers that have to be pulled before this one can be - hence the term 'leads'. A close-up of the lever lead on the left, an ex-GWR brass style. 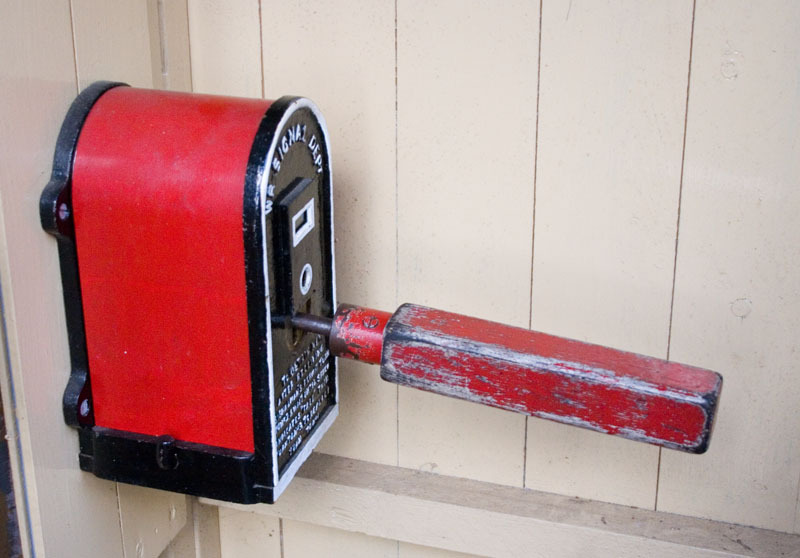 This is the lever that allows the signalbox to 'switch out', after which signals can be cleared to allow the station to be used as a dead-end terminus. 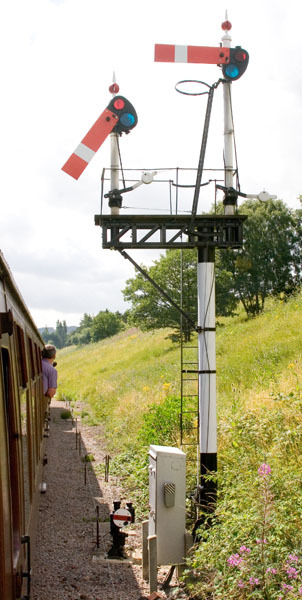 The token instrument for the single-line section to Winchcombe. 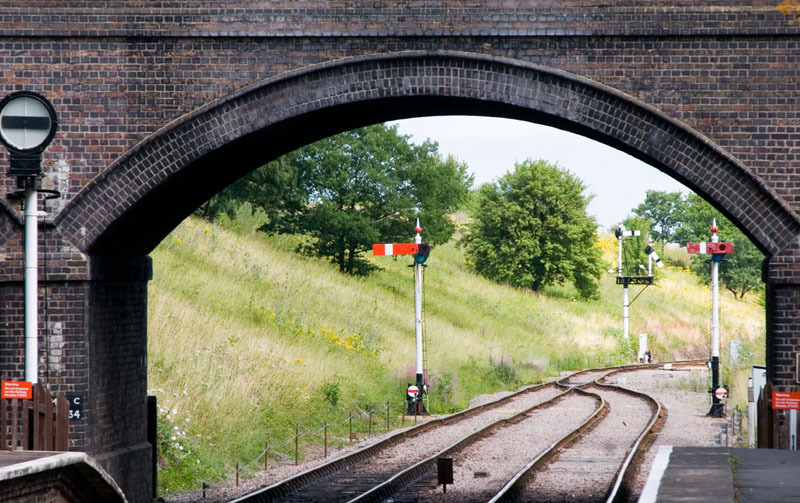 A further section north of here to Lavington is now open, and Toddington has been resignalled as a through station with both platforms signalled bi-directionally. 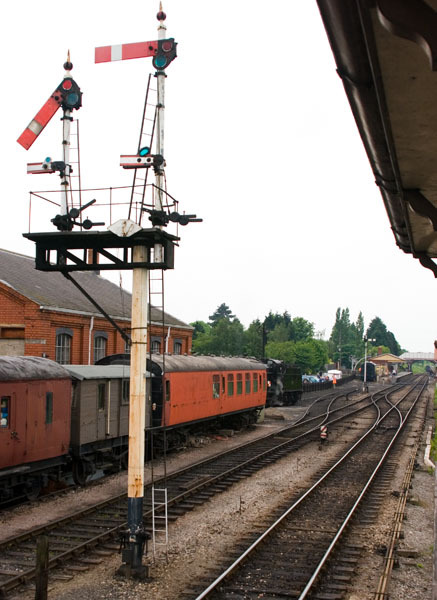 The 3'-arm signals at the northern ends of the platforms have been replaced with these advanced starters (the splitting signal for trains arriving from Winchcombe has been renamed the down starters, in accordance with GWR/BR(WR) naming conventions as it is in advance of the signalbox). Beyond them the down intermediate homes can be seen, with a train from Laverton signalled into the down platform. In the opposite direction, the crossover from the Winchcombe line into the yard was removed not long after my previous visit. A new up innerhome, which the DMU is approaching, has been erected in roughly the same place. The up home can also be seen beyond that (above the bracket of the up starters splitter). 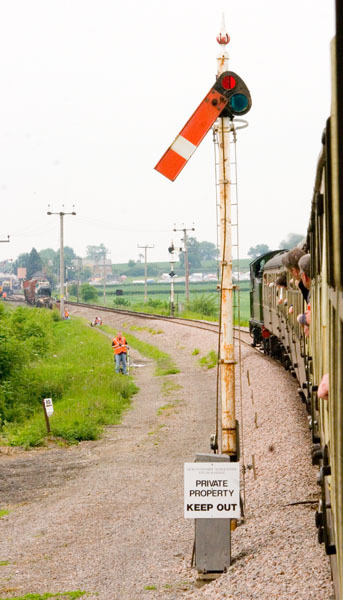 The up outer advanced starter is the section signal towards Lavington. Even further out beyond that is the down home. This is the newly provided down distant. 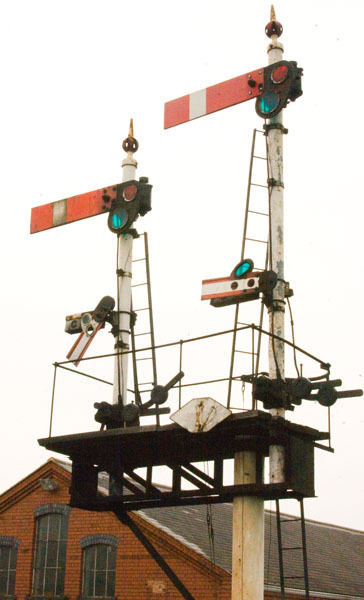 This centre-pivot signal controls departures towards Lavington from the down platform. 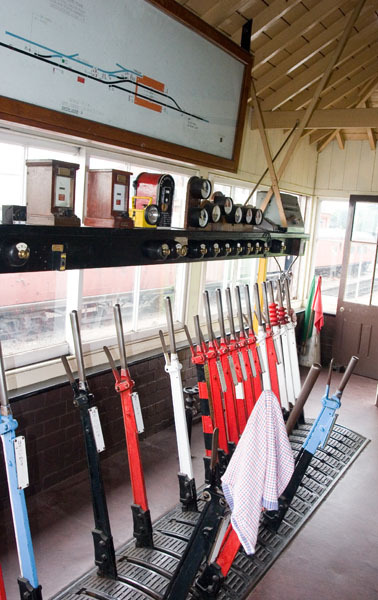 This GWR shunting key instrument has been pressed into use to hold the one-train staff for the section to Lavington, allowing drivers to collect this from the platform as the signalbox is at the other end of the layout.